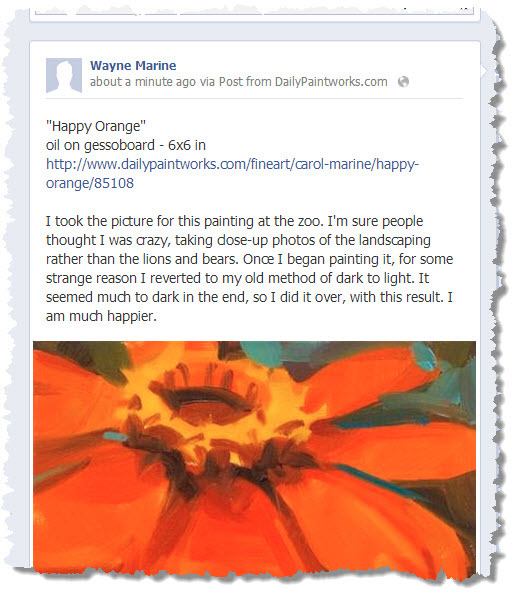 You can now easily post your artwork to your Facebook page directly from your Art Tracking grid. This isn’t a "Liking" or what you get with using Networked Blogs app with a small thumbnail but instead, a full-fledged post with a large image and the artwork’s title, page link, media, size, and description. 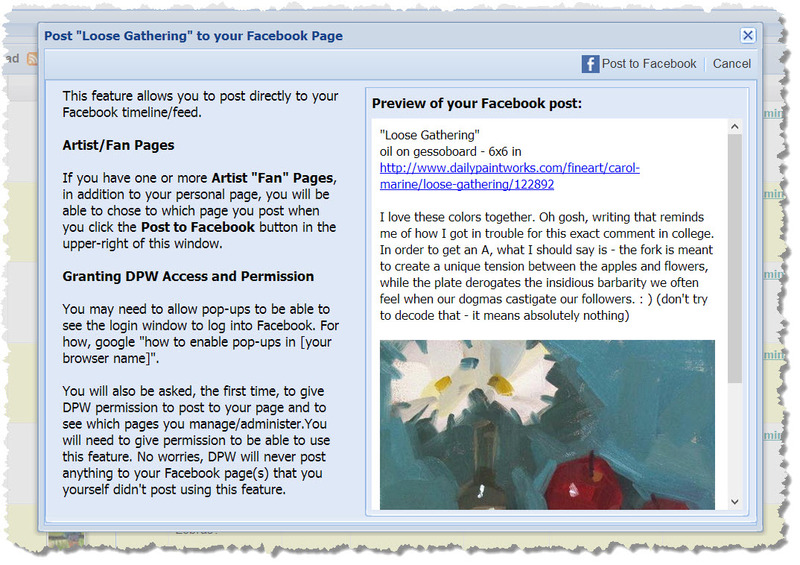 If you have one or more Artist "Fan" Pages, in addition to your personal page, you will be able to chose to which page you post when you click the Post to Facebook button in the upper-right of the Post to Facebook dialog. If you are not already logged into Facebook (however who isn’t these days?) you will be asked to do so. If you are already logged in, then you will be asked the first time only to allow Daily Paintworks to post to your Facebook page. No worries! Any posting by DPW will only be from you directly posting your artwork through the grid. DPW will not post any other content - ever - to your Facebook page! IMPORTANT: You will need to allow pop-ups for DailyPaintworks to be able to see both the login and the posting permissions windows. To find out how to allow pop-ups for your browser, google "How to allow pop-ups for [browser name here]". Step 2. Review the preview of your post. While you cannot change the structure of your post, you can always close the preview window and change the title, media, size, and description in your Art Tracking grid. Step 3. Post your Artwork! When all is how you want it, click the Post to Facebook button and your artwork will be posted to your Facebook page and go out to all your friends, just as if you created the post yourself. Posted - Sun, Feb 17, 2013 at 3:59 PM. This article has been viewed 10544 times.